D Locks and U Locks typically feature a heavy duty hardened steel shackle which offers masses of internal horizontal and vertical shackle clearance for maximum versatility. This makes them a practical choice for use with heavy duty security chains or plastic sheathed, braided steel security cables, where the overall diameter of the steel links or the security cable is too bulky to fit comfortably into the jaws or shackle of a conventional type of padlock. There are also units such as the Squire Eiger product, which are specifically designed to be used as Bicycle locks, offering a relatively compact and lightweight type of portable security which is practical for the cyclist to carry with them wherever they travel. 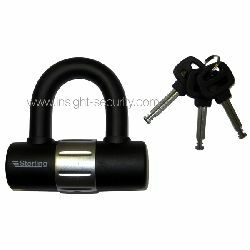 As a lock for use with security cables used to lock up garden equipment or tools, etc.